Brothers, this little story is not strictly about Freemasonry, however it is one I think you should read. “Aw poop” (or something like that), I mumbled as I drove into a parking space in front of the Cannon Funeral Home. It was Saturday morning April 7 and I was there for Brother David M. Rattray’s memorial service. Brother Rattray was a long time member of Waller Masonic Lodge #808 AF & AM. He had been a Mason for 32 years, a 32 degree Scottish Rite, a Shriner, an ex-marine and a member of the Waller Chapter of the VFW. After the service they lined up at attention with their flags on each side as Brother Rattray’s remains were carried from the funeral home and then accompanied them to the Waller cemetery. “The Patriot Guard Riders is a diverse amalgamation of riders from across the nation. We have one thing in common besides motorcycles. We have an unwavering respect for those who risk their very lives for America’s freedom and security. Each mission we undertake has two basic objectives. I would advise everyone to never say anything detrimental to our troops or unpatriotic in front of them. Everyone of these fellers are some kind of serious patriots and it makes me feel good to know them better. Excellent! I'm glad to see that there are responsible opposing viewpoints with regard to the idiots who have been traveling to other funerals. I am glad the fallen heroes to not go to their final resting place amid catcalls and vile sentiments. Respect is a fading concept in America. Our schools find it hard to teach it to our children. Our legislatures find it missing in its members. Our politicians claim to have it and give it, but fewer and fewer of them can define it, can recognize it, can earn it. These folks, Knights of the Two Wheeled Iron Horses, know what it is, know who's earned it, knoow who else gives it, who else shows it, who else deserves it. Let's all make an effort to show it TO them in return. Maybe together we can bring it back to life in America. It was interesting to read the info from the Patriot Guard's website. The fact that they are there is not what saddens me, its the fact that there is a need for them to be here! I praise these men for the job they are doing. Im afraid Im still learning to subdue my passions when it comes to people that interupt funerals. ANYONE interupting a funeral, and most certainly that of a vet, needs to have a severe attitude adjustment administered! 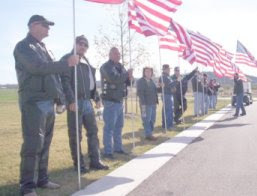 I was one of the Patriot Guard Riders who was invited to attend the service for Mr. Rattray. Yes, it Was a very cold and rainy day, but what we went through is nothing compared to what our Soldiers both past and present go through to assure us of the Freedoms we all enjoy today and hopefully tomorrow. I would like to thank you once again for allowing us the Honor to attend Mr. Rattray's service to show our Respect for him and his service for our Great Country. Thank you for the kind words about the Patriot Guard Riders and No we won't bite you lol but we Do believe in showing those who have passed and those who have not, that have given us the Freedoms we all enjoy the HONOR and RESPECT each and everyone of them deserve. Thank you also for the great meal, it kept me warm for my 80 mile ride home (yes it was still cold and raining) but no where near the warmth I get from being able to do what we do! God Bless America, and may God Bless us one and all!